The world could be coming to an end today. Or so some conspiracy theorists would like you to believe after NASA said that a potentially life-threatening asteroid is heading towards the planet. As per a report by the Express NASA says that this asteroid is at least as big a two-storey building and has been named as Asteroid 2018 WN. But don’t worry. The huge space rock is only expected to skim past our planet, and it will be making its closest appearance at 11.49 am GMT which happens to be somewhere around 5.00 pm IST. The diameter of this asteroid is said to be around 40 feet to 91 feet. Now it may not be as big as to cause a life-threatening apocalypse, but it sure does pose a big threat to highly populated areas. 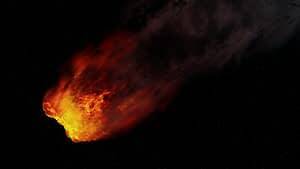 When you think about how much damage 65ft-wide space rock crashed in Russia injuring nearly a 1,000 people and shattered windows, you would assume the worst for this asteroid as well. Still, it is worth also mentioning that as per reports no human has ever been killed by a meteorite or so it is believed. Also Express reported that astronomers recently admitted the presence of undetected asteroids in our galaxy – some of which post a threat to life on Earth.